This book examines one growing response to this dilemma. 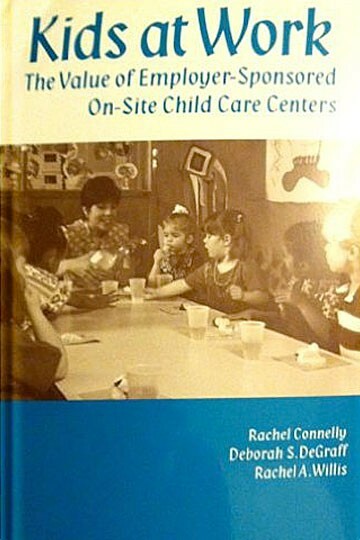 Connelly, DeGraff, and Willis chronicle the trends in the growth in on-site child care programs and perform analyses that shed light on the value of employer-sponsored child care (ESCC) to employees. The authors note that employees may not be the only ones to benefit. Employers may be able to gain wage savings for the firm. The authors employ two approaches in this study to seek answers to key questions concerning the benefits of ESCC including 1) Why do some firms choose to offer ESCC while most do not? 2) What is the value to the firm offering ESCC? and 3) What is the value to employees of a firm offering ESCC? The first approach they use is an empirical study based on an analysis of three firms in the same industry. Two of those firms offer ESCC and the third does not. The primary contribution of this effort is to analyze the value of ESCC to the employee. The second approach to estimating employee valuation of ESCC uses a contingent valuation technique for eliciting the worth of the benefit directly from employees. Both approaches broaden our understanding of the benefit of ESCC to employees and, therefore, to the employer as part of a compensation package. Connelly, DeGraff, and Willis also address the question of whether government should play a role in the decision of firms to offer ESCC as a benefit, first by reviewing current policy on child care, then by presenting several economic factors that could influence the government’s decision to play such a role. Overall, the findings presented in this study will be of interest to human resources managers considering an on-site center and to policymakers evaluating possible approaches to helping parents cope with child care expenses.